Scientists at Emory University School of Medicine have identified a central regulator of toxin production in the bacterium C. difficile, the most common cause of healthcare-associated infections in the United States. 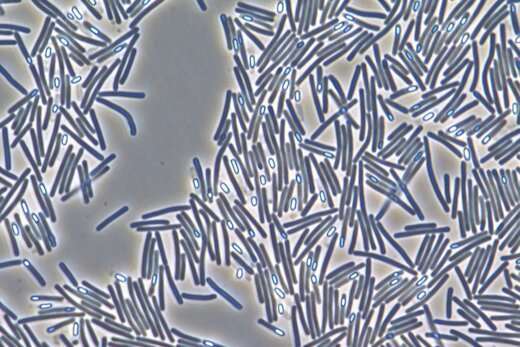 C. difficile is a major cause of persistent diarrhea, occurring most often after taking antibiotics. The results were published in the journal mBio. The laboratory of Shonna McBride, Ph.D. investigates how C. difficile regulates toxin production and spore formation, the production of dormant cells that can survive long-term in the environment and hospital settings. Understanding the conditions during infection that promote toxin production could provide targets for new antibiotics and insights regarding how the bacteria control toxin synthesis. C. difficile produces two toxins that damage intestinal cells and cause the symptoms of infection, but making these toxins requires a lot of energy. Environmental stress increases toxin production, but having an abundance of nutrients around, such as amino acids, peptides and certain sugars, suppresses the production of toxin. Working with McBride, instructor Adrianne Edwards, Ph.D. had previously spotted a gene that regulates both toxin production and spore formation. They named it RstA, for "Regulation of Sporulation and Toxins." In their current mBio paper, the researchers showed how the protein encoded by RstA controls toxin gene activity. "This one protein is critical for preventing toxin production by controlling multiple factors that are important for toxin expression," says McBride, assistant professor of microbiology and immunology. Edwards was able to pull the RstA protein out of bacterial cell extracts by using specific DNA fragments from toxin genes as bait. Using this pulldown method, Edwards also demonstrated that RstA binds to the DNA of other regulatory genes that control toxin production. By tracking the effects of mutating part of the protein, the scientists were able to confirm that RstA acts directly as a DNA clamp to control toxin expression. The predicted structure of RstA suggests that it is a "quorum-sensing" protein and is involved in sensing the presence of nearby bacteria by interacting with a small molecule produced by bacteria. Edwards showed that RstA likely interacts with a small molecule made only by C. difficile to allow it to bind DNA. However, the genome of C. difficile is organized in a way that is different from many closely related bacterial species, so it has been more difficult to find the signal. "Identification of the cofactor that controls RstA activity is a high priority, as this will likely provide insight into the physiological conditions and/or metabolites that influence C. difficile TcdA and TcdB [the toxin proteins] production," the authors conclude.